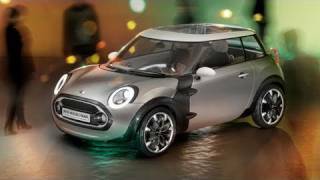 During last year's Geneva Auto Show MINI unveiled one interesting concept dubbed the Mini Rocketman. Unfortunately, despite the fact that the concept managed to win the hearts of many fans and enthusiasts, the Rocketman has been dropped. However, if you count yourself amongst those who wanted to see the concept on sale fret not because there's still a chance for this to happen, as MINI revealed a revised version of the concept which will now make its debut at the 2012 Olympics in London. The idea behind the concept remains intact so it comes with the same 3+1 seat arrangement and the double hinged long doors. The Rocketman retains the principle of "creative use of space", however the new take on the concept brings some changes when compared to the last year model exhibited at Geneva. The most notable change is that the Rocketman now features a new color scheme, so if last year silver was the predominant color, the new model bears the colors of the British national flag, with red and white accents contrasting with the predominant dark blue. In addition, the carbon fiber elements around the wheel arches and at the door hinges remain exposed, whilst matte porcelain white is to be found on the mirror caps, around the radiator grille and the door and boot openers. The car sits on a set of 18 inch light-alloy wheels that retain the same color scheme as the rest of the car, with metallic red accents on white polished areas. The Rocketman comes with other unique features besides the double hinged door, such as the full-surface glass roof illuminated in Britain's Union Jack flag. As for the engine powering the whole package, MINI has not revealed anything regarding the matter, but for me personally the Rocketman is all about the looks and I couldn't care less if it would come with the standard 1.6 liter unit. As mentioned before, the MINI Rocketman Concept 2012 is planned to make its debut at the 2012 Summer Olympics in London. However there's still no certainty as to whether or not the concept will go into full production, but we've seen crazier concepts hitting the streets, such as the Nissan Juke-R, so it wouldn't surprise me if the Rocketman will be sold in a limited edition sometime later this year, or early next year. I suppose in the end it all comes down to the public's reaction.